aide | How to ballot for a Johnny's concert. How to ballot for a Johnny's concert. 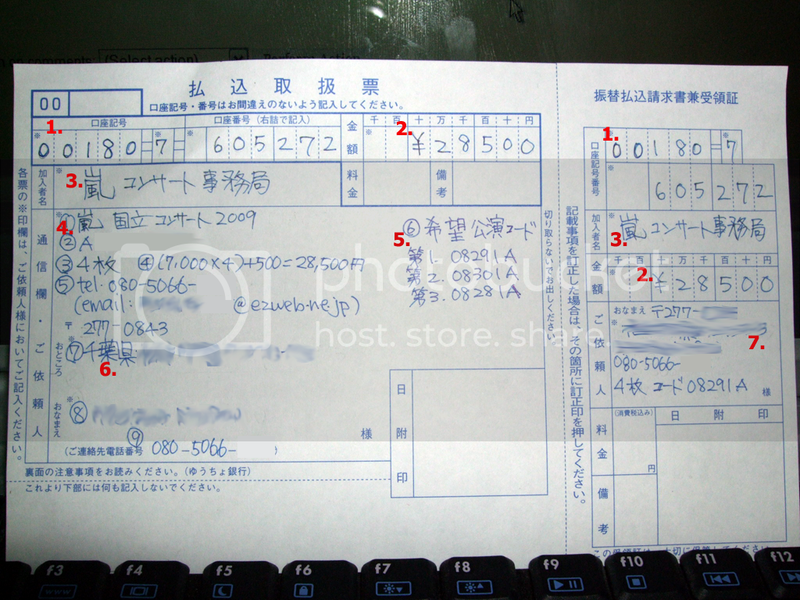 Sometimes the fanclub has their act together and sends a preprinted form and sometimes they don't so you have to pick up a blank payment form (払込取扱票 harakomi toriatsukai hyou) from any Japan Post branch and fill it in by hand. Fanclub account number - 00180-7-605272. Align the third section to the left so that the first cell (from the left) is empty. (6) Which show(s) you are balloting for. Sometimes they give you 3 choices, sometimes not. Write the concert code of the shows. The stub on the right is your copy but you still should write it out all nice. They change information they want you to write in the tiniest info box in the world but this time they want your address, name, phone number, # of tickets and the concert code of your number one choice. They don't specify more, but there's no room for more. I'm not going to post this to any communities but if you want to share it around, go for it.